BALDWIN & CRADOCK. - Empire of Japan Yedo.. Empire of Japan Yedo.. - BALDWIN & CRADOCK. Map maker : BALDWIN & CRADOCK.. Size : 15.4 x 12.5 inches. / 39.0 x 31.7 cm. 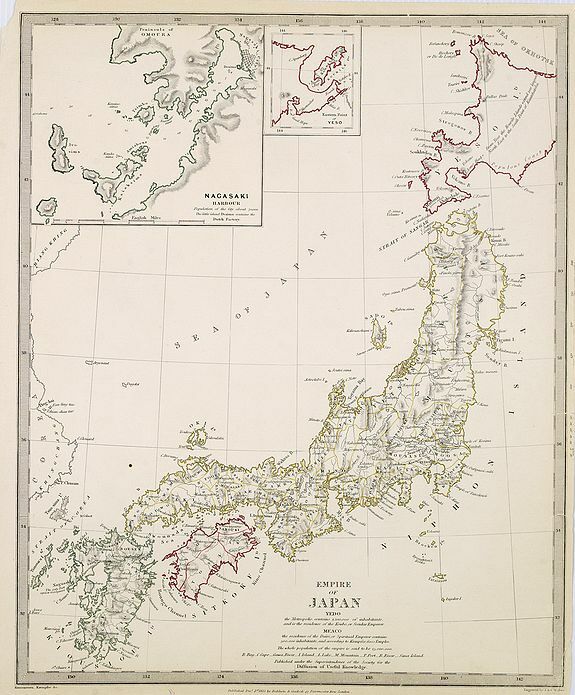 Description :Decorative steel engraved map of Japan. In an inset the bay of Nagasaki and in another inset the eastern point of Yeso (Hokkaido. Including the islands Argonaut and Dagelet and part of the east coast of Korea. Condition : Margins cut short as issued.